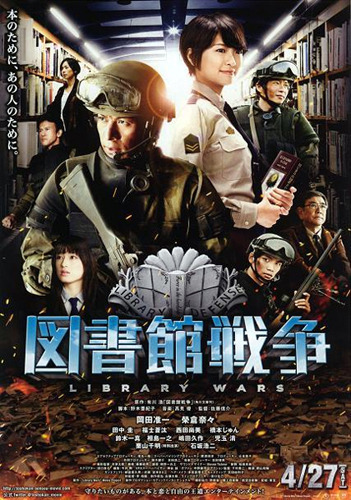 Cast: Okada Junichi, Eikura Nana, Tanaka Kei, Fukushi Sota, Kuriyama Chiaki and Suzuki Kazuma. In 1988 the Media Improvement Act was put in motion by the MBC (Media Betterment Committee). The MIA has the sole purpose in censoring books and other material deemed too violent or too vulgar for the public. Due to the publics aggression and refusal to cooperate, the MBC was granted arms, in order to abide law. This sparked the LDF (Library Defense Force), and was formed in 2004 to oppose censorship: who also was provided arms. Kasahara Iku (Eikura Nana) is opposed to the censorship, and was once in an iffy situation with the MBC since her favorite book almost got censored. But she was heroically saved by a LDF, whom she is unable to recognize. This event leads her to join the LDF. Here she meets her instructor Dojo Atasushi (Okada Junichi), whom she cannot stand, but little does she know he is the very hero who saved her. I heard about this movie from an episode of VS Arashi, and I have always been a fan of Okada Junichi, so this was not a problem to watch. There was one thing though: I didn’t think it said ‘Library’ as in the place where there are books, but I thought ‘Liberary’ as in liberty, or at least there was a miss translation. I was quite surprised it actually was LIBRARY as in the place with books, and that LIBERARY is not a word. So… Yeah, a movie about censorship of books, and actual was, with guns and swat uniforms. Believe it or not the idea is not THAT bad, but seriously… people die… like you know… guns and shooting… FOR BOOKS. I love books and I am against the entire censorship, but dying for books in the 21st century is barbaric. Like really. How stupid do people need to become in order to have other people die, just because you can’t agree on censorship?! Anyways… It is really well-made and action packed. The pace and story is great, so is everything about the relationships – a decent movie with all it need. I don’t really like Eikura Nana, but she was bearable here. Okada is awesome as usual, so no complaint from me. All in all, a great and entertaining movie.